The purpose of this Sample Question Set is to provide you with information about the Dell EMC PowerEdge Specialist for Implementation Engineer exam. These sample questions will make you very familiar with both the type and the difficulty level of the questions on the DES-4121 certification test. To get familiar with real exam environment, we suggest you try our Sample Dell EMC PowerEdge Implementation Engineer Certification Practice Exam. 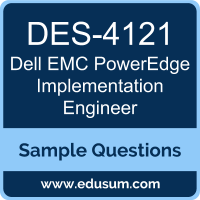 This sample practice exam gives you the feeling of reality and is a clue to the questions asked in the actual Dell EMC Specialist - Implementation Engineer - PowerEdge certification exam. The purpose of this Sample Question Set is to provide you with information about the Dell Networking Associate exam. These sample questions will make you very familiar with both the type and the difficulty level of the questions on the DCAN-100 certification test. To get familiar with real exam environment, we suggest you try our Sample Dell EMC Networking Associate Certification Practice Exam. This sample practice exam gives you the feeling of reality and is a clue to the questions asked in the actual Dell Certified Associate - Networking certification exam. The purpose of this Sample Question Set is to provide you with information about the Dell EMC Cloud Infrastructure and Services exam. These sample questions will make you very familiar with both the type and the difficulty level of the questions on the DEA-2TT3 certification test. To get familiar with real exam environment, we suggest you try our Sample Dell EMC Cloud Infrastructure and Services Certification Practice Exam. This sample practice exam gives you the feeling of reality and is a clue to the questions asked in the actual Dell EMC Certified Associate - Cloud Infrastructure and Services Associate (DECA-CIS) certification exam. The purpose of this Sample Question Set is to provide you with information about the Dell EMC Midrange Storage Solutions Specialist for Technology Architect exam. These sample questions will make you very familiar with both the type and the difficulty level of the questions on the DES-1D11 certification test. To get familiar with real exam environment, we suggest you try our Sample Dell EMC Midrange Storage Solutions Specialist Certification Practice Exam. This sample practice exam gives you the feeling of reality and is a clue to the questions asked in the actual Dell EMC Certified Specialist - Technology Architect - Midrange Storage (DECS-TA) certification exam. The purpose of this Sample Question Set is to provide you with information about the Dell EMC VxRail Appliance 4.x Deployment and Implementation exam. These sample questions will make you very familiar with both the type and the difficulty level of the questions on the E22-285 certification test. To get familiar with real exam environment, we suggest you try our Sample Dell EMC VxRail Appliance Deployment and Implementation Certification Practice Exam. This sample practice exam gives you the feeling of reality and is a clue to the questions asked in the actual Dell EMC VxRail Appliance 4.x Deployment and Implementation (DEC) certification exam. The purpose of this Sample Question Set is to provide you with information about the Dell EMC Expert - SC Series exam. These sample questions will make you very familiar with both the type and the difficulty level of the questions on the DEE-1721 certification test. To get familiar with real exam environment, we suggest you try our Sample Dell EMC SC Series Expert Certification Practice Exam. This sample practice exam gives you the feeling of reality and is a clue to the questions asked in the actual Dell EMC Certified Expert - Implementation Engineer - SC Series (DECE-IE SC Series) certification exam.